I don't understand why mainstreet buildings, today, aren't build in the same style as these. Would it really be that hard to make buildings beautiful? And I'm definitely with you on the building styles. In Forsyth's case, the really tragic thing is that the owners of several of these buildings have covered up much of that great old architecture with some of the ugliest sheet-metal facades imaginable ... turned what was a very handsome block into something of an eyesore. Makes me sad. And yep, I'm glad those 1950s clothing styles are long gone! I imagine what we're seeing here is a little out of the ordinary, though ... people had pulled out their cowboy clothes in honor of the horse show. What a great picture. My sister lives there now, so I'm familiar with that street. 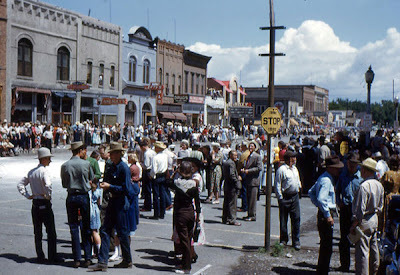 I love the pictures of Eastern Montanans in the 50's. One can tell that to get out the clean and starched dress clothes, shine the shoes and wear a good hat was such a treat for them! Yep, a great shot of a great little town. It's the everyday photos like that one, I think, that end up being the most treasured in the long run ... and they're the ones that folks like me who do historic research always value the most.